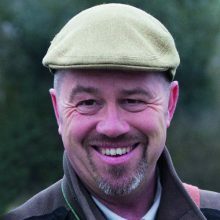 Nick Ridley considers which dog is best for rough shooting, and what is needed for you and your dog to become a successful team. The Welsh springer spaniel can make an excellent roughshooting dog. Which dog for rough shooting? 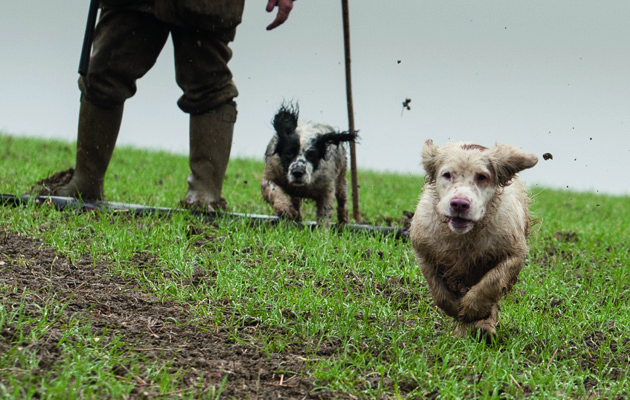 For many gundog owners there can be nothing more exciting and rewarding than shooting over their own dog. However, it takes hours and hours of training to produce a dog that will hunt within shot range, is steady to flushed game (especially ground game) and is a competent retriever. There is often heated debate as to which breed of dog is the best for this kind of shooting, but there isn’t one straightforward answer as there are several factors to consider — not least of which is what breed suits your individual personality. The most obvious breed to look at is one of the spaniels and it would normally be a springer or the popular cocker. However, there are a few other breeds of spaniel that should be given consideration, such as the Clumber or even the Welsh springer. If you are planning to do a lot of duck shooting as well as general game shooting, then a springer may be better as the smaller cocker doesn’t do well if constantly wet and cold. But if your hunting ground is white grass or tight stick piles, then a cocker will really come in to its own. 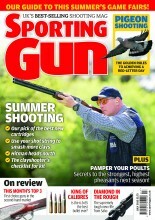 If you prefer your walked-up shooting to be taken at a slower pace, a Clumber may well fit the bill. They are the largest spaniel breed, sometimes unfairly labelled “cumbersome.” If you get one from established working lines they can be very athletic – though shooting over them can be a slightly more relaxed affair. 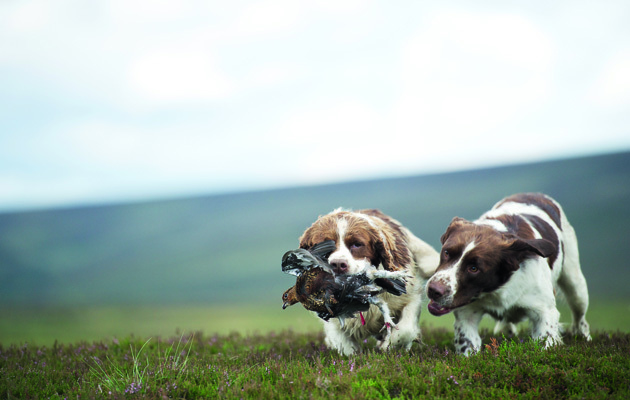 Clumber spaniels will allow you to hunt at a more leisurely pace. The hunt, point, retrieve breeds such as the German shorthaired or wirehaired pointers, Hungarian vizsla, Weimaraners and the Italian spinone can all make excellent rough-shooting dogs. They hunt up and when game is scented they will freeze on point until commanded to go in and flush – but, unlike our native English setters and pointers, these Continental breeds are also required to retrieve. They ideally need large areas of ground to cover as their hunting pattern is far wider than the spaniels’. They can do very well in open woodland and hedgerows but, if the cover is thick when they come on point, it can be difficult to locate them. The retrieving breeds should not be discounted – given the chance, they will hunt up and can be trained to sit to the flush. They obviously excel at their main task of collecting and are happy to sit in a pigeon hide or tucked up in rushes at the side of a flight pond. However, when being shot over, most will be used as “non-slip retrievers.” Traditionally, this means that the dog will walk at heel without a slip lead and, as game is flushed by the line of guns and shot, will be sent for the pick-up. If you have trained your dog to be steady both to flush and pick up, it will not steal another dog’s retrieve. To really get the best out of your rough or walked-up shooting dog, it needs to train to work a good, tight quartering pattern, ideally within shotgun range. When hunting hedgerows it is always best to work them downwind as your dog will always prefer to have any scent blowing towards it and so be less likely to go through to the other side. Always be ready as you get towards the end of a hedge: often the corners are left scrubby and game that has been pushed down the hedge will hole up there. I like to pull my cockers out of the hedge and work them through these unkempt areas. No matter what your breed, you must keep a high level of concentration and watch your dog closely. A slight increase in pace or tail action can indicate that the dog has winded its quarry. Quite often, a dog will “feather” out on an area in an effort to work out where the scent is coming from, especially if it is hunting ground game. The flush, when it comes, can be an explosive action and you need your wits about you. I have been involved in many heated debates as to whether a rough shooting dog should stop to the flush or run in and make a retrieve as quickly as possible and I can see both sides of the argument. Personally, I want my dogs to stop as soon as any game takes to the wing or runs. That way my shot is not hindered in any way and I know that my dog is safe. Once you have taken your shot you can then quickly send the dog to make the retrieve, all under control. More importantly, if you have trained your dog to be steady to both flush and shot, it will not go charging off to “steal” another dog’s retrieve. Believe me, it’s blood-boiling stuff to have your dog work its socks off to find a pheasant, get a nice flush, stop and get a good mark on the dead bird — only to watch a fellow Gun’s dog come charging in to pick up! Another good reason to make sure your dog is steady to birds flushing is that if you are working light cover such as root crops and your dog is out on a retrieve it can easily bump into a covey of partridges. If it then starts chasing the starburst of birds, all hell can be let loose and the day’s sport can be totally spoilt. Another question that quite often causes debate is whether or not a rough or walked-up shooting dog needs to be trained to take hand signals. Over the years I have found this skill very useful, especially if the dog has been unsighted when the bird was shot, as can quite often happen when hunting in cover. Ideally, the dog should at least be able to take a “go back” command so you can get it out in the general area, bearing in mind most walked-up birds are shot out in front of the Gun. You could, of course, always walk out to the fall area and work your dog, but if you are shooting in a line you are then walking over areas that may still hold game and this may well be disturbed. Curiously enough, on many occasions I have seen gundogs work an area for some time looking for a retrieve and as a result there has been quite a bit of disturbance and yet when the gun line starts walking again birds are still flushed from the area. Like cooking a good meal, all the skill is in the preparation and if you really want your gundog to excel as rough or walked-up shooting dogs then be serious about their training and make sure the basics are in place before taking them out into the shooting field. What do you about ferreting in the summer months?